Peering over the edge of the cliffs into the breaking Ionian sea; legs a little unsteady and feeling as if a gust of wind could blow us off the edge, we felt exhilarated at finally being here. This was Lefkatas the southern-most tip of Lefkada. We had hiked the long and twisting 16km from Vasiliki where we had left the boat to witness for ourselves the site of the Leucadian Leap – where lovesick souls jumped to their death and condemned criminals were thrown to theirs. Once there stood a shrine to the Greek god Apollo where now stands a lighthouse, built in 1813, and legend has it that the famous ancient poetess Sappho leapt to her death on this very spot for the sake of unrequited love. 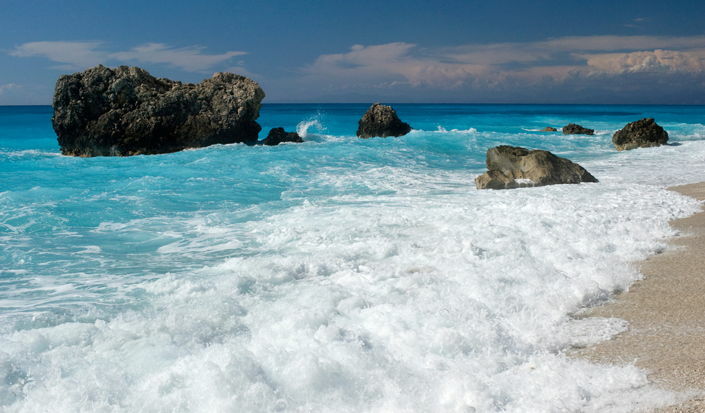 The Western coast of the Ionian Island of Lefkada is home to some of the most exquisite white sandy beaches in Greece, with a backdrop of ragged white cliffs from where the island gets its name (Lefko = white). Having picked up our charter boat in Lefkas Town the previous day, we set off down this coast, passed Agios Nikitas - the only village at sea level on the western coast. Full sails and a good wind led us to Kalamisti beach and 10 minutes uphill to Kalamisti village perched at 380m on the cliffs where we stopped off for a swim and a light lunch. Here we sampled the local produce; fresh olives, local wine, preserved meats, lentils and salads drizzled with local olive oil. With renewed energy we set sail again cruising past delightful rugged scenery until we came upon the breathtaking beach of Porto Katsiki, a small sandy paradise nestled at the base of a pale concave cliff. Its aquamarine waters and white sand the perfect place to while away the rest of the day swimming, snorkeling and basking in the sun. Later on, in the early evening we rounded Cape Lefkas below the impressive cliffs and marveled at their wild beauty, frozen as if in the act of crashing down. This was the site long associated with human sacrifice and ritual leaps. It is said that lunatics and criminals were once hurled from the high cliffs in order to 'purify' their souls. Leaping from these cliffs became a fad among fashionable Romans when rejected by their lovers. Other ancient cliff jumpers made primitive parachutes to slow their plunge into the sea, where rescue parties awaited them while, today, the cliffs are a popular launching place for hang gliders. Now, we were at the top looking down at the angry sea, imagining the terror. 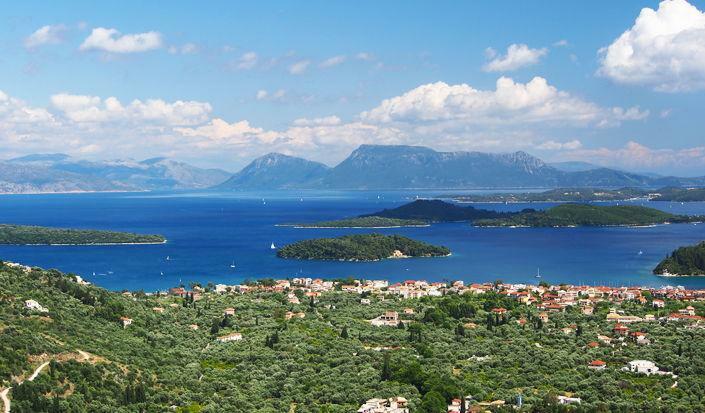 At last, looking up, we cast our eyes over Lefkada to the lush green eastern coast in stark contrast to the west – our destination for the next week’s sailing; Syvota, the islet of Meganissi, Nydri , Lygia and the site of ancient Lefkada at Kalligoni. Facing south across the blue expanse of the Ionian we could see the northern tip of Kefalonia and beyond that the island of Ithaca and dreamed of new sailing adventures of the future amongst these verdant Ionian Isles.